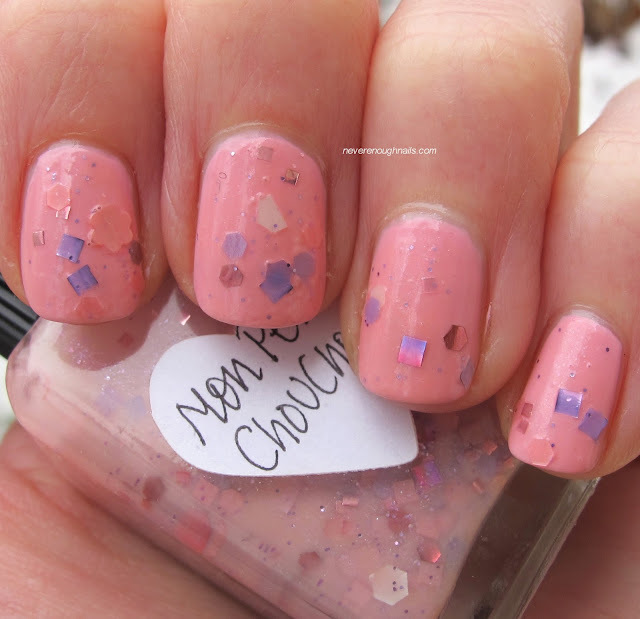 OPI Pink Friday was sent for review. Lynnderella Mon Petit ChouChou was purchased with my own money. All opinions are my own honest thoughts. Happy Easter! So I may have mentioned this a few times here, but I don't really wear pink polish very often. I own a ton of it, but it seems to just sit there (except for neon pinks, those I wear in the summer). I have to say, it was kind of a nice change of pace to wear Lynnderella Mon Petit ChouChou for a few days though. 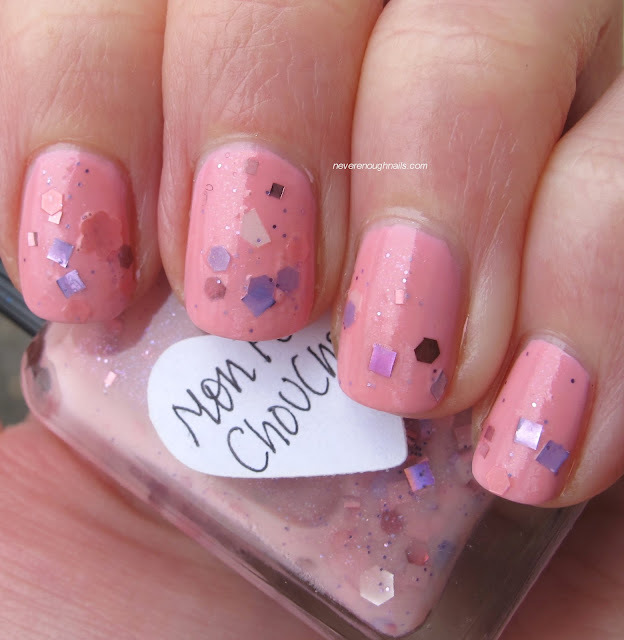 Mon Petit ChouChou is from Lynn's Groundhog Day collection, so I'm still playing catch-up here! 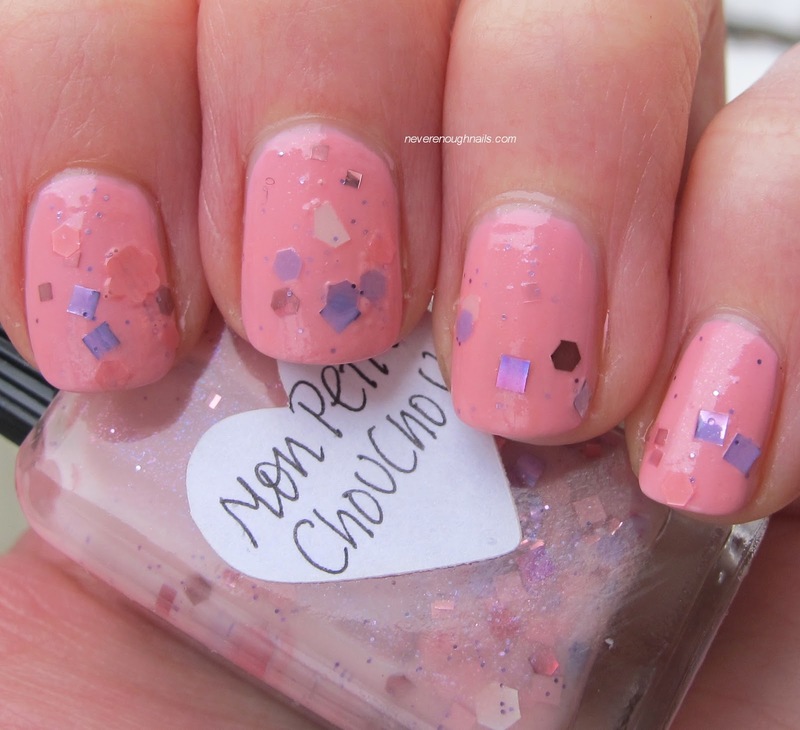 I wanted a nice matchy pink base for this mani, so I dug OPI Pink Friday out of my pink drawer. Pink Friday is a nice bubblegum creme that I actually like, but haven't worn since I got it due to my lack of pink love. Mon Petit ChouChou is a sheer pink base with lots of purple shimmer. There is lavender, white, and pink glitter, as well as some holo glitter pieces, flowers and hearts. I got a nice pink flower on my index finger and a lavender heart on my right thumb nail that I could not for the life of me take a decent picture of. Mon Petit ChouChou was pretty good to work with. Some of the glitter needing arranging, so I just pushed it around with my brush a bit. That giant pink flower laid nice and flat though, so that was excellent. I used two dabbed and pushed coats of this over two coats of OPI Pink Friday. I thought this looked like a pretty combo for Easter! Do you have any good Easter plans? Lynnderella Mon Petit ChouChou is available now on Lynnderella.com.